The late bank robber named Willie Sutton was once asked why he robbed banks. He answered: “That’s where the money is.” While this may have been true at one time, from the perspective of modern economists, Sutton is both right and wrong. He is wrong because the overwhelming majority of money in the economy is not in the form of currency sitting in vaults or drawers at banks, waiting for a robber to appear. Most money is in the form of bank accounts, which exist only as electronic records on computers. From a broader perspective, however, the bank robber was more right than he may have known. Banking is intimately interconnected with money and consequently, with the broader economy. Banks play two key roles in the functioning of the economy, first by facilitating the payments system and second by serving as financial intermediaries. Banks are a critical intermediary in what is called the payments system, which helps an economy exchange goods and services for money or other financial assets. Banks make it far easier for a complex economy to carry out the extraordinary range of transactions that occur in goods, labor, and financial capital markets. Imagine for a moment what the economy would be like if all payments had to be made in cash. When shopping for a large purchase or going on vacation you might need to carry hundreds of dollars in a pocket or purse. Even small businesses would need stockpiles of cash to pay workers and to purchase supplies. A bank allows people and businesses to store this money in either a checking account or savings account, for example, and then withdraw this money as needed through the use of a cash withdrawal, writing a check, using a debit card, or some other form of electronic payment. Watch this video to the see a simplified model of how banks work and how they earn money. Banks are a convenient place to store one’s savings, rather than looking for a person or business that is willing to borrow from them and then repay them at a later date. Transaction costs are the costs associated with finding a lender or a borrower for this money. Thus, banks lower transactions costs and act as financial intermediaries—they bring savers and borrowers together. Along with making transactions much safer and easier, banks also play a key role in the creation of money. An “intermediary” is one who stands between two other parties. Banks are a financial intermediary—that is, an institution that operates between a saver who deposits money in a bank and a borrower who receives a loan from that bank. All the funds deposited are mingled in one big pool, which is then loaned out. 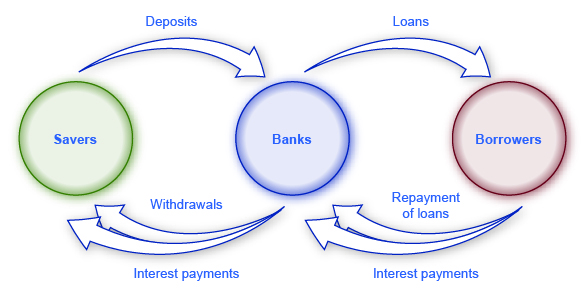 Figure 1 illustrates the position of banks as financial intermediaries, with deposits flowing into a bank and loans flowing out. Of course, when banks make loans to firms, the banks will try to funnel financial capital to healthy businesses that have good prospects for repaying the loans, not to firms that are suffering losses and may be unable to repay. Figure 1. Banks as Financial Intermediaries. Banks act as financial intermediaries because they stand between savers and borrowers. Savers place deposits with banks, and then receive interest payments and withdraw money. Borrowers receive loans from banks and repay the loans with interest. In turn, banks return money to savers in the form of withdrawals, which also include interest payments from banks to savers. Financial intermediaries include other institutions in the financial market such as insurance companies and pension funds, but they are not included in this discussion because they are not considered to be depository institutions, which are institutions that accept money deposits and then use these to make loans. Banks offer a range of accounts to serve different needs. A checking account typically pays little or no interest, but it facilitates transactions by giving you easy access to your money, either by writing a check or by using a debit card (that is, a card which works like a credit card, except that purchases are immediately deducted from your checking account rather than billed separately through a credit card company). A savings account typically pays some interest rate, but getting the money typically requires you to make a trip to the bank or an automatic teller machine (or you can access the funds electronically). The lines between checking and savings accounts have blurred in the last couple of decades, as many banks offer checking accounts that will pay an interest rate similar to a savings account if you keep a certain minimum amount in the account, or conversely, offer savings accounts that allow you to write at least a few checks per month. Figure 1 shows the annual rate of interest paid on six-month, one-year, and five-year CDs since 1984, as reported by Bankrate.com. The interest rates that savings accounts pay are typically a little lower than the CD rate, because financial investors need to receive a slightly higher rate of interest as compensation for promising to leave deposits untouched for a period of time in a CD, and thus forfeiting some liquidity. Figure 2. 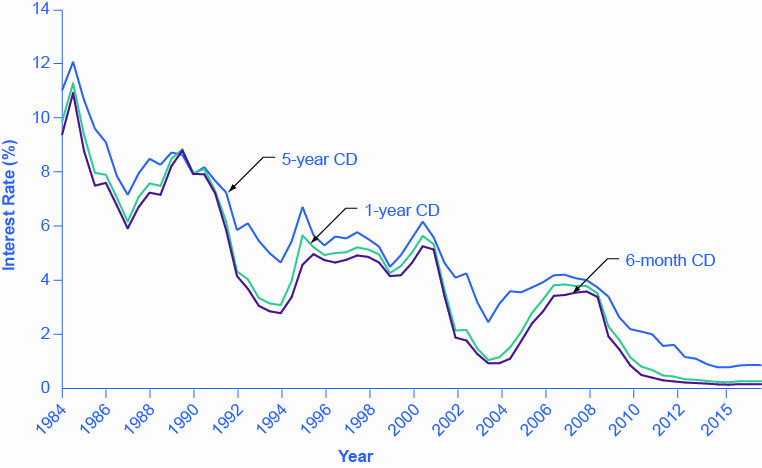 CD Interest Rates. The interest rates on certificates of deposit have fluctuated over time. The high interest rates of the early 1980s are indicative of the relatively high inflation rate in the United States at that time. Interest rates fluctuate with the business cycle, typically increasing during expansions and decreasing during a recession. Note the steep decline in CD rates since 2008, the beginning of the Great Recession. The great advantages of bank accounts are that financial investors have very easy access to their money, and also money in bank accounts is extremely safe. In part, this safety arises because a bank account offers more security than keeping a few thousand dollars in the toe of a sock in your underwear drawer. In addition, the Federal Deposit Insurance Corporation (FDIC) protects the savings of the average person. Every bank is required by law to pay a fee to the FDIC, based on the size of its deposits. Then, if a bank should go bankrupt and not be able to repay depositors, the FDIC guarantees that all customers will receive their deposits back up to $250,000. HOW ARE BANKS, SAVINGS AND LOANS, AND CREDIT UNIONS RELATED? Banks have a couple of close cousins: savings institutions and credit unions. Banks, as explained, receive deposits from individuals and businesses and make loans with the money. Savings institutions are also sometimes called “savings and loans” (S&L) or “thrifts.” They also take loans and make deposits. However, from the 1930s until the 1980s, federal law limited how much interest savings institutions were allowed to pay to depositors. They were also required to make most of their loans in the form of housing-related loans, either to homebuyers or to real-estate developers and builders. A credit union is a nonprofit financial institution that its members own and run. Members of each credit union decide who is eligible to be a member. Usually, potential members would be everyone in a certain community, or groups of employees, or members of a certain organization. The credit union accepts deposits from members and focuses on making loans back to its members. While there are more credit unions than banks and more banks than savings and loans, the total assets of credit unions are growing. Both credit unions and savings institutions are considered depository institutions. In 2008, there were 7,085 banks. Due to the bank failures of 2007–2009 and bank mergers, there were 5,571 banks in the United States at the end of the fourth quarter in 2014. According to the Credit Union National Association, as of December 2014 there were 6,535 credit unions with assets totaling $1.1 billion. A day of “Transfer Your Money” took place in 2009 out of general public disgust with big bank bailouts. People were encouraged to transfer their deposits to credit unions. This has grown into the ongoing Move Your Money Project (watch a video about the project and competition between big banks and smaller community banks here). Consequently, some now hold deposits as large as $50 billion. However, as of 2013, the 12 largest banks (0.2%) controlled 69 percent of all banking assets, according to the Dallas Federal Reserve. system by which buyers and sellers exchange money for goods, services and financial capital.